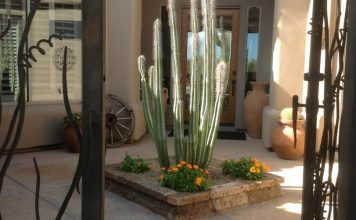 The art of approach... Our work in Scottsdale & Phoenix courtyard design. 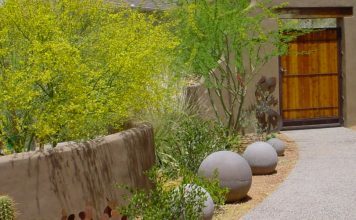 Classy and classic garden courtyard design is an enchanting passage for guests arriving at this Scottsdale home. Travertine paving, fountain, and flowers. A great look that borrows traditional materials and treatments. This modern rustic courtyard design is casual, and colorful. A walk no one will want to hurry down, coming or going. The landscaping here grabs your attention - part art gallery and part garden. 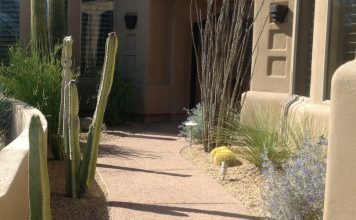 Front entry courtyard design needn't be all paving. Colorful Phoenix landscaping courtyard design. 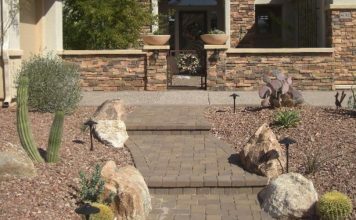 Courtyard landscaping need not be extensive or ornate to look wonderful. 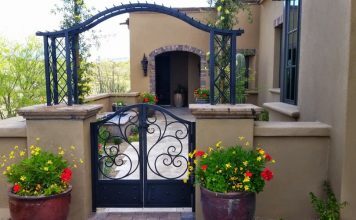 Gorgeous stone, an artistic gate and a few plants do the trick. 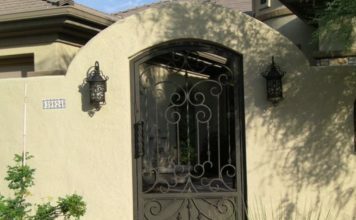 Curving arched stucco privacy walls frame the essential iron gate, creating a lovely secluded courtyard enclosure. A very welcoming space. Why waste precious space with just retainer walls and plants when a raised, roomy courtyard gives you more room for living? This front entry courtyard had a narrow concrete walk. 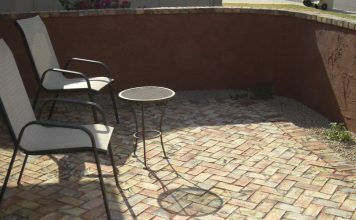 Travertine stone pavers create more depth than if Phoenix pavers were used here. Lush, contemporary and open. 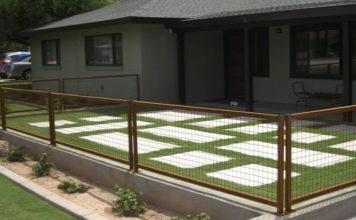 A unique approach to the Phoenix landscaping courtyard design that is budget minded and great looking. 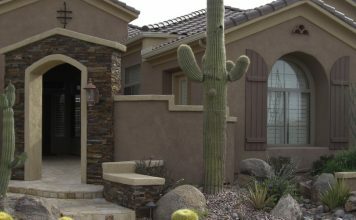 Stunning combination of taupe adobe and stone masonry walls blend traditional and contemporary design. 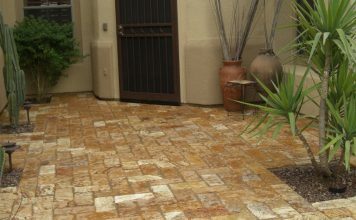 Pavers sidewalk and courtyard flooring. 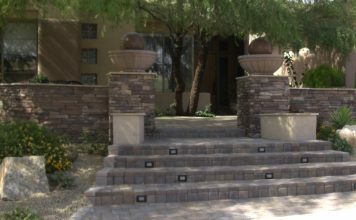 Natural stone walls blend with the front entry of this home making the courtyard design's appearance that it has always been there.